Niki Daly, London: Frances Lincoln, hb. 978 1 8478 0105 0, £11.99, 2011, 24pp. I received a lot of positive feedback following my review of Ruby Sings the Blues, so thought another book by Niki Daly might be welcomed. 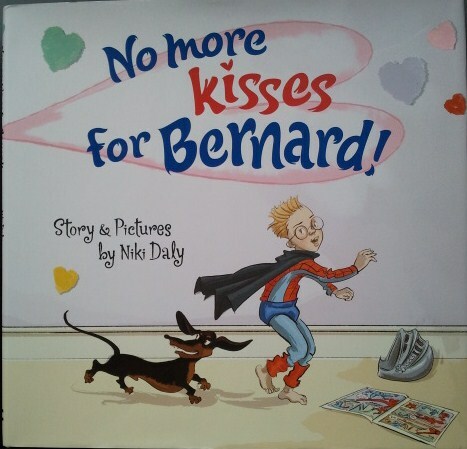 Bernard, the hero of this delightful picture book, lives an idyllic life; one filled with love, activity, culture, stimulation …. and kisses. His four doting aunts smother him with every conceivable kiss on a regular basis, with complete disregard for how infuriating Bernard finds them or how sticky they make his face. In a desperate attempt to quell these unwanted displays of affection, Bernard declares, ‘No more kisses!’ And he means it. Through its vibrant illustrations and artfully constructed text, this book highlights the importance of respecting people’s feelings (and faces) and not setting out to upset them. Bernard and his aunts travel through several emotional storms before finally reaching a happy compromise which suits everyone. An inspirational story, full of warmth, humour and moments of reflection, that will engage young readers and adults alike. If you have enjoyed the two books by Niki Daly recommended here, you may also find Not So Fast, Songololo! a gorgeous read, as well as being recognised for its groundbreaking approach to the writing of post-apartheid picture books.